Slate Detail is New Orleans' Auto Detailing and Car Care Specialist, specializing in restoring, enhancing, & protecting your vehicle. We are committed to our values of providing a great customer experience with results through trust & passion. 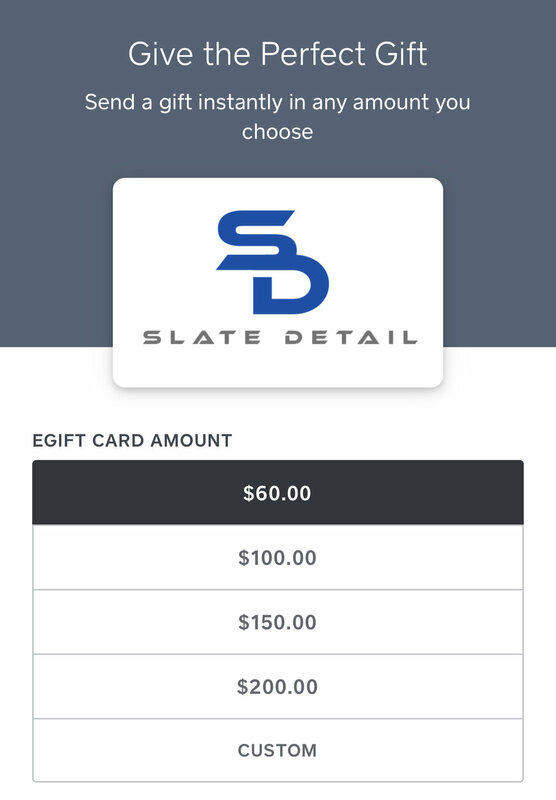 Slate Detail is happy to now offer mobile detailing. This service is by appointment only. Our Mobile details are performed at your location: we come to you! Our equipped mobile detail van will arrive at your location to properly detail your vehicle while you are at work, shopping or at your home. To book our mobile detailing services, click the button below. *Booking this service guarantees an appointment but due to scheduling the exact time may vary due to other possible appointments that day. You will be contacted by Slate Detail to confirm your appointment as close as possible to your preference. Slate Detail is an automotive detailing company that has taken pride in restoring and protecting automobiles. With this passion, we have put together a regimen that is for everyone. Whether you are looking to give your vehicle the shine it once had or turning in a leased vehicle that needs cleaning, we are your detailing company. Slate Detail is reasonably priced and is in the business of making our valued customers repeat customers. We have services that meets everyone's needs and budget, but we make sure that once we are done you will enjoy driving your vehicle. RECOMMENDED FOR: A newer car, or a car that has been previously well-kept. Swirling & paint defects are minimal, and the interior is kept in fair condition. RECOMMENDED FOR: vehicles looking for a fresh start and more than just a basic wash. Clay Bar and Wax included in this package. RECOMMENDED FOR: vehicles looking for a fresh interior. Including Shampoo/Steam of interior and more! Drive Slate is our monthly maintenance plan that is designed to be the money saving solution to keep your vehicle looking it’s best, all month long. Each plan is customized to meet your budget & maintenance needs. Whether you require service monthly, bi-weekly, or quarterly we will work to determine how best to care for your vehicle based around its use and your lifestyle. Upon enrollment, your first service includes a full detail to restore, enhance, & protect your investment. Each vehicle enrolled in Drive Slate also receives 15% off additional services like headlight restoration. There are no long term commitments necessary and you can purchase this package on a month to month basis. Please call for more details. This service also available for mobile detailing (call for details). Looking for a great gift for someone special. We offer two options for that perfect gift. Our eGift Cards give you the quick option to email someone a gift code for our services, while we also offer hard copy gift cards in our office. eGift Cards can be in any value up to $500, while our gift cards can be for any amount. Whether you are looking for a quick gift or looking to purchase a detail for someone, our gift cards make a great gift. To purchase, click one of the options below.